When we introduced the Micro Clock MKII, we didn’t anticipate the amount of demand and controversy that managed to accompany it. External clocking is certainly a hot button issue. Some folks maintain that there’s no basis for it; that it’s a sort of modern “emperor’s new clothes.” The reasoning behind this is that the device being clocked externally will simply filter the incoming clock signal through its phase locked loop, thereby eliminating any sort of benefit associated with the superior clock. In addition, the simple act of accepting the incoming signal and creating a new signal that’s in phase will add some jitter. The biggest problem with this theory is that we know nothing about the PLL filter in question; it’s completely hypothetical. Many PLL’s in pro audio are designed to filter out unwanted signals that are outside of the desired bandwidth, although some are configured to filter out unwanted harmonics that lie within the signal’s frequency band. It’s incredibly rare to find one that does both at the same time. In the case of the Micro Clock MKII, it outputs a high bandwidth signal that is rare to find in internal clocks. Whether or not an external word clock can improve the sound quality of a receiving device is completely dependent on how the receiving device accepts an external word clock signal, and is dependant on the quality of the receiving device’s internal clock. It’s best to do an A/B listening comparison to know whether the external clock is making a positive impact on the sound or not. The Micro Clock MKII is simple and probably even boring looking by most standards. It’s housed in a rugged 3” x 4” chassis that provides optimum RF shielding. It has no lights, no frequency display, and none of the usual visual candy that your friends might envy. However, for a modest black box, it does its job incredibly well and at a price that’s unheard of for this level of performance! It features six selectable output frequencies from 44.1 kHz on up to 192 kHz. The output level is approximately 5 volts peak to peak. Jitter at the crystal oscillator is approximately 1 picosecond RMS, and just under 10 picoseconds RMS at the output. The power supply is a 9 volt DC wall wart that’s capable of accepting both 120 and 240 volts AC. The clock is compatible with all modern digital devices that have 75 ohm BNC word clock inputs. “Don’t buy it for its looks (like anybody ever looked on the inside of a record cover to see what a digital device looked like…) but rather pay attention if you’re the owner of a Digidesign LE hardware unit or some of the other low to mid-priced interface/converters on the market. The Micro Clock MKII really does a lot to snap those 1’s and 0’s in line for a much smoother and more coherent, dare I say “3D” sound. 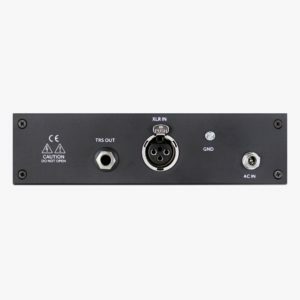 Features 3 BNC outputs for multiple sync of your studio’s digital devices. Against many on board clocks, the Micro Clock MKII is like taking a camera off of auto focus and spending some time really dialing it in manually (not that you have to dial the unit in). Better yet, another way to say it is if you’re looking out of the window and then you open the window for a more pure vision. I don’t believe in voodoo but voodoo this box isn’t: it’s a serious clock that on lower cost devices can change the way you hear “into” your mix. I hear a slight smoothing of the sound, the guys at BLA attribute it to the use of transformers in the output section. “Just wanted to give you all an update on things going on over here. I am presently in mix stages for my production work on Native Canadian (Metis Indian) country blues singer, John McLeod. It’s been an amazing process thus far utilizing all of my BLA studio processors. The record was recorded at Stagg Street Studios on a Vintage Legacy API console utilizing some of the best Mic collection on the west coast. Featuring “Fritz” Lewak on Drums (Jackson Browne, Melissa Etheridge) and Tim Emmons (Rod Stewart, Bo Diddley) on Bass. Of course I made sure I brought along my Micro Clock to keep everything sounding beautiful and solid. “A client of yours, John VanEaten, loaned me his Micro Clock to try out. After a few days, I really didn’t want to give it back to him! I had just returned from Nashville visiting some friends (including Masterfonics engineer, Jonathan Russell). We had a listen to some recent mixes of mine and discovered I was a bit dark on the top and a tad cloudy on the bottom. I was of course bummed but curious what was going on, speakers, room whatever. When I got the Micro Clock in here, something magic happened on the top that opened things up and allowed me to tweak these mixes easily and avoid the dreaded “darkness.” Also, the bottom end became obvious and the cloudiness could be addressed with ease. This was the first word clock generator that clearly showed a large difference from other clocks I’ve used in terms of my ability to work better. Wanting to explore this more, I invited my friend Doug Thornton (a film composer) who has an Apogee AD16 (with the Big Ben clock in it) over yesterday and spent the day listening to the stock SSL clock (Alphalink), Apogee, the BLA and a little bit of the Lynx all using the SSL converters in my PMC 5.1 rig. We listened to a lot of music, commercial releases, differing styles… and then to some 5.1 surround mixes my friend brought over for a film he’s posting. Both the music and film sound took on new dimensions with the BLA clock… There was a sense of “you can touch it” with your clock. The SSL and Lynx are not even in the same zip code and we shortly stopped listening to them. ? I have been using my micro clock since before Christmas. I can attest to the fact that this little device works!! The lack of any indication that it is on or a clear easy to read screen that indicates the settings in current use has not phased me one bit! To me what matters is whether it works, and boy oh boy does it work. I am using the Focusrite Red 4Pre with the micro clock. So no need for this little device at all. No multiple digital stuff to keep in sync. Just the 4Pre! Everything sounds sweeter, crisper, cleaner, more defined. For several years I have been contemplating this decision and now I can’t see how I could get by without it! I always believed that a better clock will yield better results from an interface based on what I know about digital audio, technology and the importance of proper timing in music. This little gem has cemented that fact for me. Thanks to the team at Black Lion Audio. I am a tough customer and don’t praise anything easily, but I cannot say enough about this product.